President Donald Trump on Monday proposed a whopping $4.7 trillion in federal spending for 2020, a plan that if enacted would boost programs for the troops and veterans and anti-immigration initiatives while slashing domestic spending. The plan has little chance of passing the Democratic-controlled House. But the details are red meat for his conservative base and outlines the administration’s priorities for the year. Among the highlights: $8.6 billion in spending for a border wall, but a $7 billion cut to the Education Department’s current spending level. Pulling back on money to enforce environmental regulations, while calling for an expansion in federal personnel who can detain undocumented immigrants and punishing local communities that protect them. The president’s budget, titled “A Budget for a Better America: Promises Kept. Taxpayers First” highlights the administration’s priorities and serves as a proposed road map for the 2020 fiscal year. Under this plan, there will not be a balanced budget for 15 years, after the president's term in office. The budget proposes a 5 percent increase in defense spending up to $750 billion, an investment the president hinted at while speaking to troops in Alaska while traveling back from Vietnam in February. 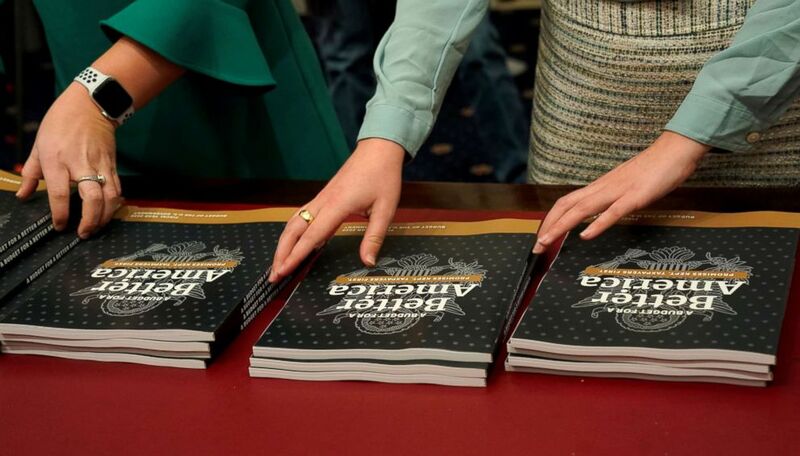 Aides place copies of Volume 1 of U.S. President Donald Trump's budget for Fiscal Year 2020 on a table after it was delivered by the Office of Management and Budget to the House Budget Committee room on Capitol Hill in Washington, March 11, 2019. "You know, I'm a cost cutter but we have no choice. Without a military, what do we have? We have to have a great military," Trump said to the troops. While the president is calling for more funding for the wall and defense, he is also calling for 5 percent cuts to non-defense spending which would affect many executive departments and agencies. The White House held a rare on-camera briefing to explain and defend the proposal Monday afternoon. The budget would also add to the national debt, in conflict with the president's promise during the campaign to eliminate the national debt over eight years. Asked by ABC News' Chief White House Correspondent Jonathan Karl what happened to that promise, acting Office of Management and Budget Director Russel Vought defended that the president had to take steps in the interest of the economic recovery. "He also came into office and had an economic recovery that was needed to put people back to work, get the economy going, and to rebuild the military, and had historic levels of military at $700 [billion] and $716 billion in national defense dollars," Vought said, and also accused the Congress of being unwilling in the last to years to have a conversation on the national debt, a statement that glazes over the reality that the Congress was in the control of Republicans the first two years of the president's term. To fund the border wall, the White House is proposing taking $5 billion from Customs and Border Patrol and $3.6 billion from Department of Defense military projects, a move that could push the administration back into the ring for a renewed fight over the president's signature campaign promise. The proposal is a steep ask from the president, whose previous request for $5.7 billion in border wall funding was denied by lawmakers and set off the longest government shutdown in U.S. history. Asked Monday whether the administration is weighing other potential executive actions for border wall funding given that Congress is unlikely to fulfill the president's new request, acting Office of Management and Budget Director Russel Vought said the administration is focused on spending the money it has. “Right now we are focused on spending the money Congress gave us in the last appropriations bill and the money we have identified as part of declaring a national emergency and spending that well,” Voight said. Asked later in the briefing whether there was anything in the budget proposal regarding Mexico paying for the wall, as Trump pledged during the 2016 campaign they would, Sanders claimed that the wall will be paid for by the updated trade agreement with Mexico and Canada. Despite active work on a bipartisan deal, the president declared a national emergency in February to secure the funding his administration felt was necessary to build barriers along the southern border. “This is in addition, to the billions of dollars we are securing through the president’s declaration of a national emergency,” Russell Vought, acting White House budget director said on CNBC Monday. 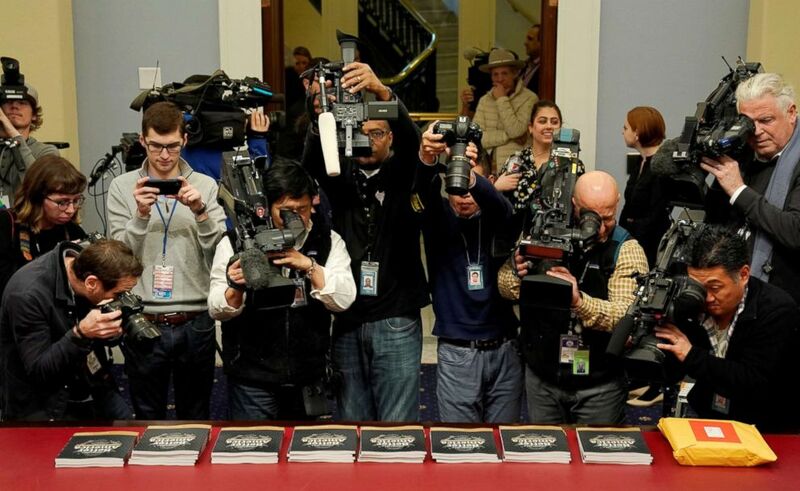 Members of the media point their cameras at copies of Volume 1 of U.S. President Donald Trump's budget for Fiscal Year 2020 in Washington. Among the departments and agencies affected: the Environmental Protection Agency which would see a 31 percent decrease, the Department of Education which would take a 12 percent cut and the Department of Energy which would see an 11 percent decrease. The Department of Health and Human Services, Department of Interior and Department of Labor would also see cuts. Democrats on Sunday were quick to announce Trump’s new border wall funding proposal dead on arrival ahead of the budget's release. In a joint statement, House Speaker Nancy Pelosi and Senate Minority Leader Chuck Schumer threatened a repeat of the government shutdown that ended in January. “President Trump hurt millions of Americans and caused widespread chaos when he recklessly shut down the government to try to get his expensive and ineffective wall, which he promised would be paid for by Mexico. Congress refused to fund his wall and he was forced to admit defeat and reopen the government. The same thing will repeat itself if he tries this again. We hope he learned his lesson," Schumer and Pelosi said in the statement. “At a time when our country faces challenges about jobs for the future, this money would better be spent on rebuilding America, and on education and workforce development for jobs for the 21st Century,” the statement continued. Following the release of the president's proposal Monday, Sen. Schumer released another statement calling it a "gut punch" to the American middle class and a "handout" to the wealthy and powerful special interests. "Its proposed cuts to Medicare, Medicaid, and Social Security, as well as numerous other middle-class programs are devastating, but not surprising. The Republican Party’s systematic efforts to rip away Americans’ health care, its continued embrace of the failed tax cuts for the rich, and its refusal to accept the science, facts, and urgent need to address the climate crisis have made cruel and unthinking budget proposals like this one par for the course," he said. White House economic advisor Larry Kudlow acknowledged that the budget's reported spending cuts and spike in border wall funding could result in another ugly fight between the White House and Capitol Hill. "I would just say that the whole issue of the wall and border security is of paramount importance,” Kudlow said on Fox News Sunday. “We have a crisis down there. I think the president has made that case very effectively." "It's a crisis of economics. It's a crisis of crime and drugs. It's a crisis of humanity. We have to be much tougher and have more constructive immigration policy, which we will be developing over a period of time. So, yes, he's going to stay with his wall, and he's going to stay with the border security and I think it's essential," Kudlow said. ABC News Anne Flaherty contributed to this report.